We are very Pleased with the Movie Screen. It is Easy to setup. It packs away nicely. The product was priced better than other retailers. Seems to fit the need we had for outdoor movie night. I would recommend the screen. I had a kid movie night party - the movie screen was a hit. Parents were over the moon inquiring where I purchased the screen and the cost. Screen is good. Easy to setup/break down. My only issue is that the air source is running 100% of the time while using it. And I realize that is how many of these inflatable things work, for a movie screen I would pay a little extra for a super quiet air source. Nice big screen. Set up is a breeze! Movies in the garden have never been better! Love the screen it's actually bigger than I expected! screen is bigger than expected and super easy set up. Take down was easily as convenient especially with bag included. i really enjoyed the movie in my back yard this pass summer useing this projection screenthe family really enjoy it. Great material wraps up to a small manageable size. Inflates and deflates quickly. Does what it's supposed to do. 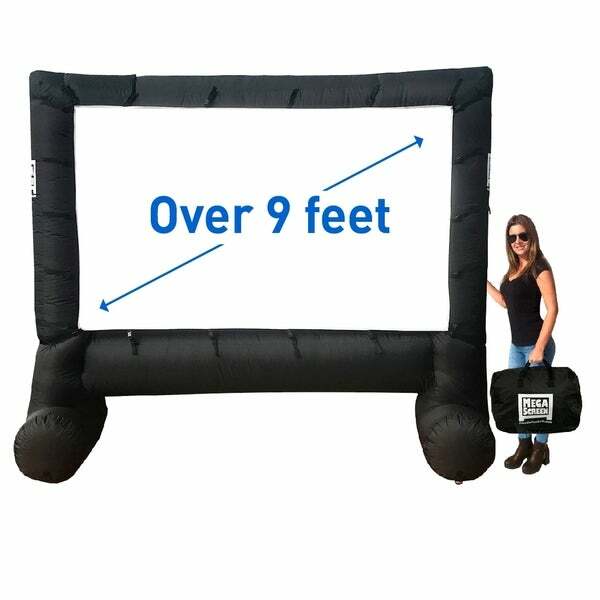 Great for backyard movie nights! "Does this screen allow rear projection?" I don't believe so. The detachable screen is akin to one of those blue plastic tarps and the back of it is solid black. "So if I buy this and then buy the actual projector, how is it connected? What else would I need?"